Samsung Galaxy J3 J330F is surely new in this market, but you can encounter problems with it due to any of the reasons. One of the most common problems faced by Samsung Galaxy J3 Pro users is the microphone issue which normally arises due to water damage or moisture. In this type of problem, you can hear the voice of others on the call, while they are not able to hear you. Microphone not working at all. The distracted sound is recorded via Mic. A distracted sound is received by the other party when talking on a call. MIC mutes randomly and at any point. MIC goes cute on call while it works well for voice recording. If you are looking for temporary workaround then all you have to do is to use the speakerphone, as it uses the different microphone in its operation. Dry your Samsung Galaxy J3 J330F with a dry towel to eliminate any visible traces of water or moisture. Clean all the openings (Headphone port, Charging port etc.) with the help of cotton buds in order to eliminate all possible traces of water and moisture completely. MIC might have encountered any kind of physical or water damage. The rubber cap of MIC is out of order or is displaced from its correct location. MIC might be too much dusty or dirty, hence causing above mentioned problems. Dry soldering of MIC connectors could also be the reason of this problem. Microphone IC might be faulty. 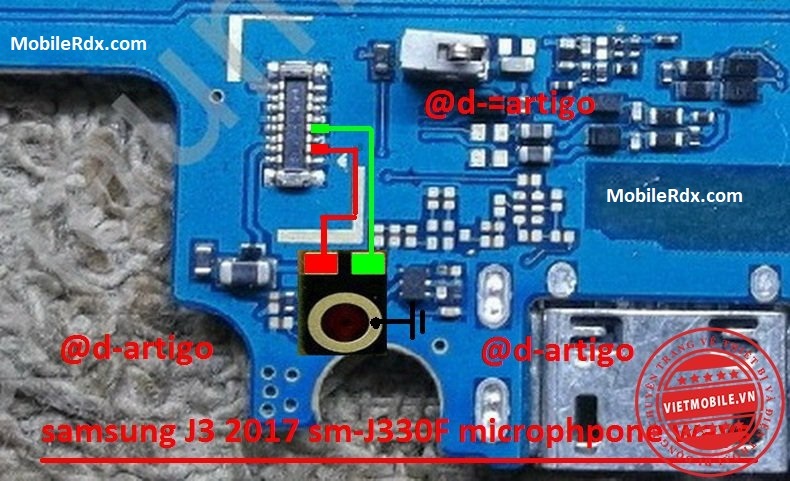 Samsung Galaxy J3 J330F Mic Solution, Microphone Not Working Problem, Mic Ways, Jumper, Mic Problem Solution.